(Bloomberg) -- Federal Reserve Chairman Jerome Powell and his colleagues made clear to investors Wednesday that they won’t be tightening policy any time soon. For Peter Yi of Northern Trust Asset Management, that makes locking in six-month U.S. dollar Libor rates a winning wager. Yi, head of short-term fixed income at Northern Trust, sees the Fed on hold through 2019. Juxtapose that against a six-month dollar London interbank offered rate at 2.8 percent -- up from about 0.75 percent point before the Fed began lifting rates in 2015 -- and it spells opportunity for Yi. 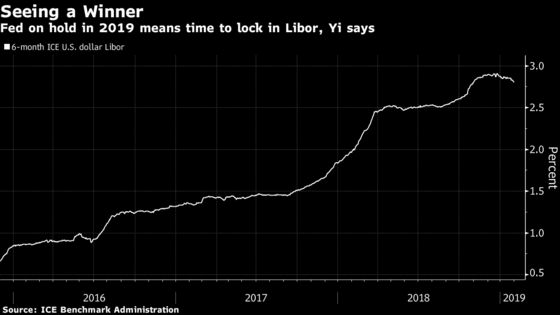 “Six-month Libor looks like a slam dunk right now,” said Yi, whose firm manages $885 billion. Investors can capture these rates by buying commercial paper or certificates of deposit with six-month maturities. With the Fed signaling that it’s standing down for now, investors may be thinking that short-term rates at these levels are as good as they’re going to get for a while. Of course, officials’ last quarterly forecasts, released in December, called for two rate hikes in 2019.